Note: daylight savings time change – fall back! With more than 100 events at over 30 locations throughout the Downtown Eastside scheduled over twelve days in this year’s Festival (October 26 – November 6), choosing what to see and hear becomes a delightful challenge. 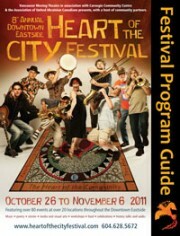 Here are our Top Festival Picks for 2011! 1. Sweet Soul Sisters of the Downtown Eastside: An evening of blues, jazz and soul that speaks to the story of our neighbourhood. Hear some of the strong women’s voices of the DTES, including Dalannah Gail Bowen, Rosanne Gervais, Heidi Morgan and Peggy Wilson accompanied by local musicians Michael Bellwood on guitar, John Cote on bass, Gary Wildeman on drums and more! 2. Sophisticated Ladies, A Tribute to Women in Jazz: A special occasion to hear the soulful voices of Thelma Gibson and Dalannah Gail Bowen in a musical tribute to the women of jazz; with Michael Creber on piano, Laurence Mollerup on bass and Chris Nordquist on drums. 3. Carnegie Jazz Band with special guest Dal Richards: Comprised of enthusiastic amateur jazz musicians, the Carnegie Jazz Band is under the wonderful tutelage of multi-instrumentalist and composer Brad Muirhead. Joining the Carnegie Jazz Band is special guest and local legend “The King of Swing” Dal Richards. The festival is thrilled that the Honourable Steven Point, Lieutenant Governor of British Columbia – and jazz fan – will attend. 4. Aboriginal Artist Showcase: This special showcase, assembled for the Honourable Steven Point, Lieutenant Governor of British Columbia, features urban Aboriginal spoken word artists, dancers, singers and musicians, including Wayne Lavallee, Juno nominated and award-winning singer and guitarist. 5. The Vancouver Inter-Cultural Orchestra Small Ensemble: We are pleased to present a small ensemble of the Vancouver Inter-Cultural Orchestra, a creative and relevant voice of musical innovation, diversity and understanding. Musicians appearing today include Lan Tung, Moshe Denburg, Ali Razmi, Bic Hoang and Jonathan Bernard. 6. An Evening with Beverly Dobrinsky and Zeellia: Singer and choral director Beverly Dobrinsky reflects upon history, fate and destiny in Dolja, a solo show with spoken word, hurdy gurdy and song. The second set features Beverly with her group Zeellia, Vancouver’s own Slavic soul band playing songs and dances from Ukraine, the Balkan states and the Canadian prairies. 7. Elvis Is In The Building: One of the world’s foremost Elvis impersonators, now retired Morris Bates, part Shuswap and part Haida, shares music and stories with current Elvis Tribute Artist Velvis, based on Morris’ life and experiences in Vegas as the King of Rock ‘n Roll. 8. Trisurgence: A new city wide cultural collaboration between the Chinese-jazz group Koan (led by Brad Muirhead), the New World Chinese Orchestra (led by Jin Zhang), the Chinese choir Huayi (led by Yaling Yang), the Renfrew Collingwood Aboriginal Youth Canoe Club song and drum circle (led by Matthew Sheena, with Squamish singer and carver Wes Nahanee) and DTES involved musicians. 9. Accordion to Immigrants: This concert of songs on accordion tells stories of the immigrant experience in the Downtown Eastside and Strathcona. Join Todd Wong, Alan Zisman, Roman Lipkovits and accordionists aplenty from the Squeezebox Circle and from the Lower Mainland. • History on the Verge: Shining Light on Our Old East End Houses: Join Strathcona-based house history researcher and heritage advocate James Johnstone on a tour highlighting Vancouver’s oldest houses and stories of the people who lived in them. • Moments of Community History Walking Tour: Join Jean Swanson of the Carnegie Community Action Project on a walk through the Downtown Eastside where moments in community history will be marked by historical plaques. • An 1886 Walking Tour: Take a walk with John Atkin, author, DTES/Strathcona resident and walking-history-encyclopedia as he travels along the streets and alleys of Vancouver as the City existed 125 years ago. • Vancouver’s Downtown Eastside Outdoor Murals: There are over 80 murals on the walls of buildings in Vancouver’s East End. Muralist and local legend Richard Tetrault will take us on a walking tour of about 15 of those murals located in the Downtown Eastside. There are sure to be many surprises! • Powell Street Walking Tour: On this historical tour, Raymond Nakamura takes you back in time to the vibrant pre-war community of Japanese Canadians and Japanese immigrants who lived and worked in the area until their forced removal in 1942. 11. Ukrainian Hall’s Community Concert, Supper & Community Dance: The festival ends on a high note with three special events on one day at the Ukrainian Hall. Start your afternoon with the Association of United Ukrainian Canadians Community Concert, featuring the Barvinok Choir, the Vancouver Folk Orchestra and the Dovbush Dancers. Lively music, invigorating dance and colourful costumes beckon us. Special guests include Todd Wong who brings a cultural fusion to his accordion playing, and a musical tribute to The Milestones – “the finest folk music ensemble in BC in the sixties” – Gary Cristall. Immediately after the concert is a delicious traditional Ukrainian Supper followed by the Community Dance with the musical fun of Russell Shumsky (marimba, percussion), Bud Kurz (guitar), Kathleen Nisbet (fiddle) and dance caller Marlin Prowell. Grab your friends, neighbours, the whole family, and head on down to this toe-tappin’ heartwarming event.